I'm heading off to the Appalachian Trail to begin my epic thru-hike adventure. So it's time to set aside all the touchstones of civilization that I've come to depend on. 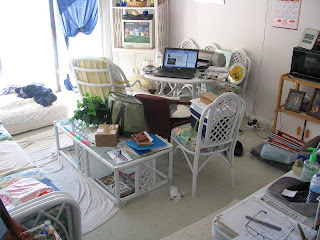 This photo is of my core comfort zone--my 'living room' in my tiny beach-front condo. The morning sun pours in off the sea - how I love to bask in the brilliant light as I sit at my laptop and work on my novel or simply browse the web. Outside my sun-drenched patio door the irrepressible sound of the surf soothes and forever beckons me. But so do the subtle siren-calls of the deep woods sylphs who lurk just beyond touching in the soft moss and undergrowth along the Appalachian Trail. Now it's time to tune in to their addictive song. It is the call of the wild. Tomorrow I head out to the trail to do a couple days of warm-up hiking and scouting. The time has finally arrived. The adventure formally begins on Sunday! What I'm giving up: TV, lazy beach combing, regular showers and clean clothes, the certainty of being dry and warm, familiar relationships - the glorious and maddening (always vibrant and dynamic) daily entanglements with family and friends. What I'm glad to be rid of: Negative Political debate and shameless, self-prostituting politicians (the 2012 election campaign and associated trappings of our decaying civilization), deciding what purpose today will present for me, personal complacency and its inevitable malaise. What I'm blessed to be granted in simple abundance: The chance to reconnect with and commune with some of the primal elements of the natural world that our ancestors intimately knew, the space and time to come into harmony with these elements, the quiet calm to incorporate this harmony into my soul.